This year AWDRI is partnering with Dog Lovers Show to bring you the AWDRI Nimble Calendar for 2019. Each month brings you a gorgeous, vibrant photo of Nimble and her family members. If you’re a fan on FB you can’t go past this quality product. They make fantastic Christmas gifts and you won’t be able to do without one on your own wall. 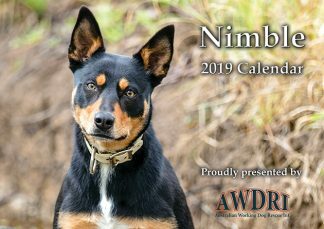 Every dollar made from the purchase of these calendars goes back into AWDRI Photography to help us continue our work capturing these magnificent breeds for posterity. If Express Postage or Registered Post is required, or for bulk orders over 10, please email nimble@awdri.com.au for instructions on payment. **After paying by direct deposit please email your deposit receipt along with your name and postal address to nimble@awdri.com.au so we can send your calendars to your nominated address. If you are buying from outside of Australia use this PayPal button to buy one or more calendars. This price is inclusive of postage. Please note only Air Mail is available. If you wish express postage or tracking of registered post please contact us via nimble@awdri.com.au for instructions on paying additional postage.